With Safety Week drawing to a close, thought a couple of practical articles would be good to offset all the theory during the rest of the week! 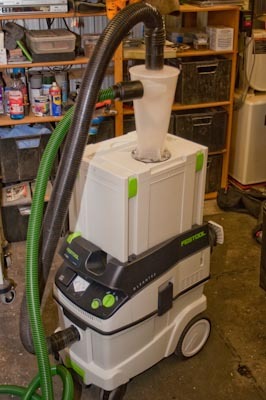 With the arrival of the Festool Cleantex Dust Collection CT36 and coincidentally the Dust Deputy, it seemed ideal to couple the two together, and especially given that Systainers can be locked solidly to the top of the Cleantex, transforming one into a dust bin seemed perfect. Step one involved removing the lid from the systainer, and that was easily achieved with the lid open, and a screwdriver inserted into the pin/hinge and a gentle rap with a rubber mallet. Rinse and repeat for the other side and the top came straight off. 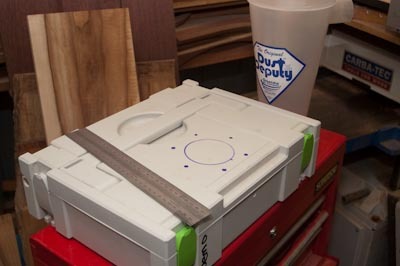 Next, I took the Dust Deputy cyclone off its original lid, and used that lid as a template to mark out where the holes need to be. I needed to offset the cyclone so it didn’t impact on the handle, and especially the forms on the inside of the lid. Underneath there is some reinforcing ribbing, and some of that had to be cut away. It doesn’t weaken the top, because I am replacing a few light ribs with a chunk of solid steel! 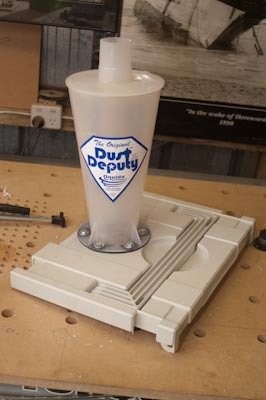 Next it was easy to bolt the cyclone on top of the lid. 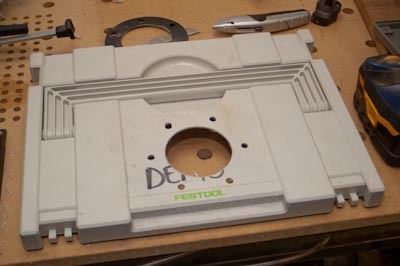 The lid, ready to go – so far a very easy modification, and other than one damaged lid, easily reversed. I got the Systainer cheaply (second hand), so the mod so far cost $10. 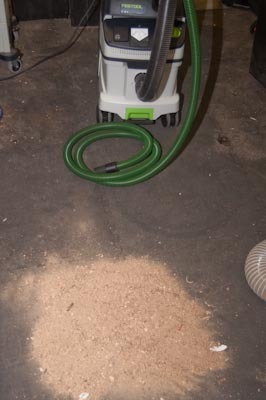 Fitting the whole unit on top of the CT36 is also a no brainer, and the hose that comes with the cyclone is a perfect size for the Festool Cleantex. Nothing left to do, but give it a test, so made a pile of dust…..
Now at this stage the system is working, but I need to make some immediate additions – the Systainer is not able to resist the strength of the vacuum, and that causes some significant leaks around the lid (and the rear wall of the Systainer gets pulled in). These leaks mean the separator didn’t work well at all (yet) because the influx of air from the collection bin means the dust was able to progress from the inlet tube to the outlet rather than fall into the Systainer. 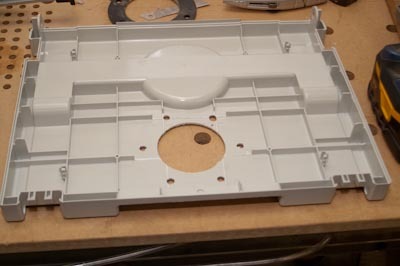 I can solve two problems with one solution – I will make a thin-walled box (MDF) to fit inside the Systainer. 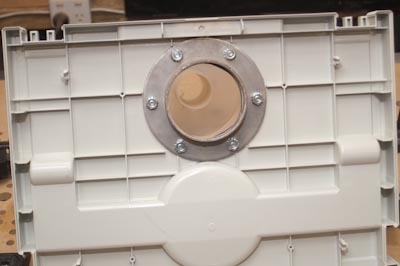 This will fully support the walls of the Systainer, as well as collect the dust and it can be lifted out to empty, rather than removing the Systainer from the Cleantex. 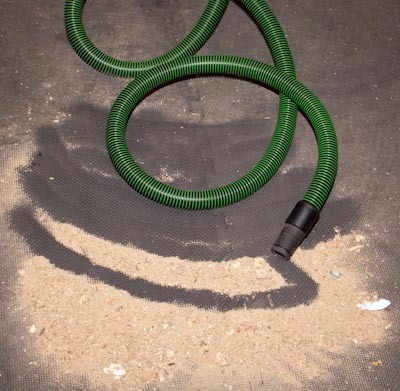 Secondly, some of that rubber that goes around windows and doors as a draught stop should significantly help the sealing, resulting in effective use of the cyclone. As a quick initial modification (30 minutes), I am very happy with how it is looking already, and with a few extra improvements should become a perfect addition to the new shop vac. Hi Jim, I ended up switching to the Oneida Dust Deputy Ultimate II a couple of years back. Uses the same cyclone unit which is excellent, but has a much better (and stronger) collector. While the mod worked, the commercial version is significantly better, particularly given the difference in wall strength between the Systainer and the Oneida bin. Thanks Stu. have been thinking of doing this for some time as I have a mini and go through so many bags as they only have the paper bags for this one. I saw a thing on you tube with Marc wood whisperer and that reminded me of what you had done.